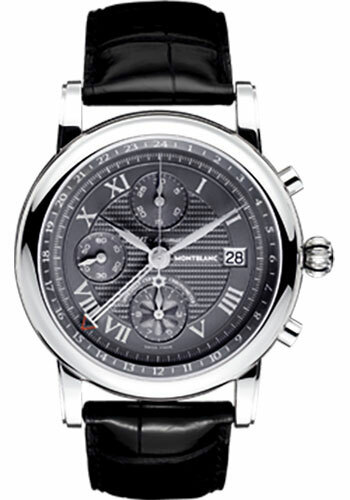 42mm 18K white gold case, sapphire crystal back, non-screw crown with 1 o-ring and18K white-gold with mother-of-pearl Montblanc emblem, domed sapphire crystal with double anti-reflective coating, anthracite guilloché dial, automatic chronograph (COSC) Montblanc 4810/503 movement with 12 hr and 30 min counters, central chronograph hand, 24-hour display with second time zone, approximately 48 hours of power reserve, black alligator strap with triple-folding steel and 18K white gold buckle. Water resistant to 3 bar (30 m). 42mm 18K red gold case, sapphire crystal back, non-screw crown with 1 o-ring and18K red gold with mother-of-pearl Montblanc emblem, domed sapphire crystal with double anti-reflective coating, beige guilloché dial, automatic chronograph (COSC) Montblanc 4810/503 movement with 12 hr and 30 min counters, central chronograph hand, 24-hour display with second time zone, approximately 48 hours of power reserve, brown alligator strap with triple-folding steel and 18K red gold buckle. Water resistant to 3 bar (30 m).